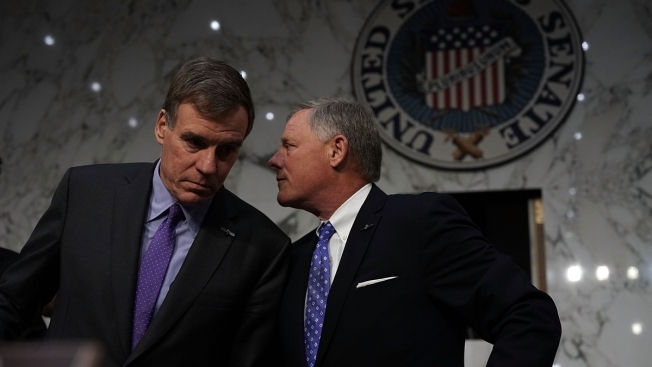 One aide said, "We were never going find a contract signed in blood saying, 'Hey Vlad, we're going to collude'"
This May 9, 2018, file photo shows Senate Intelligence Committee Chairman Sen. Richard Burr, R-NC (right) and ranking member Sen. Mark Warner, D-Va. (left), at a confirmation hearing for CIA director nominee Gina Haspel. The Senate Intelligence Committee's investigation into the 2016 election has uncovered no direct evidence of the Trump campaign conspiring with Russia, Democrats and Republicans on the committee told NBC News. But different parties' investigators in the probe, which is winding down, disagree over the implications of a pattern of contacts between Trump associates and Russians. Last week, Sen. Richard Burr, the panel's Republican chairman, told CBS News that, while more facts may be uncovered, "If we write a report based upon the facts that we have, then we don't have anything that would suggest there was collusion by the Trump campaign and Russia." Democratic Senate investigators told NBC News on condition of anonymity that Burr's characterizations, while accurate, lacked context. One aide said, "We were never going find a contract signed in blood saying, 'Hey Vlad, we're going to collude.'"